Anti-war campaigners from the Stop the War Coalition and CND will be having a protest delegation to protest against Trump's inflammatory statements and behaviour towards North Korea (including his threat, made on Nagasaki Day, that he will unleash "fire and fury") this Friday at 1pm at the US Embassy on Grosvenor Square. The delegation will be handing in a statement calling for a de-escalation of the Korean crisis. The standoff between the US and North Korea is frightening. The cycle of threat and counter-threat is creating an appalling situation in which warfare between nuclear states is being discussed as a serious option on both sides.In this context Donald Trump's outburst against the North Korean regime is deeply troubling. What impact can threats of 'fire and fury' ?have but to escalate tension and increase the likelihood of a catastrophic confrontation? The urgent priority must be the opposite, to de-escalate and pursue a negotiated resolution to the crisis, which major players in the region are trying to achieve and most commentators recognise as eminently possible. This would, however, require a sharp change of direction from both sides, including from the US, which has dramatically increased its military capabilities in South Korea and its military presence in the area. Already this week US B-1 bombers have flown from Guam over the Korean peninsula, joining the South Korean and Japanese airforces in joint exercises. Such provocative actions on both sides must end. We must demand our governments focus on a peaceful resolution to this confrontation. Reports coming out of Syria suggest that a joint military force of US, British, and Jordanian troops, equipped with tanks and helicopters, have reportedly been deployed in the war-torn country's southern border areas from Jordan's northern region. The troops are now reportedly positioned in a long strip region across the border zones of Syria's southern provinces of Dara'a and Suwayda, from Tel Shahab rural area, just a few hundred meters from the Jordanian border, to al-Nasib Border Crossing and Khirbet Awad village. The forces have also been seen near Ramtha, a Jordanian city, located in the far northwest of the Arab country close to the Syrian border. The media bureau of Syria's Joint Operation Command also released a number of aerial photos , taken by drones, which purportedly showed the presence of a large number of British Challenger tanks, UK's main battle tank (MBT), and American Cobra and Black Hawk helicopters. The exact number of the ground troops is not known, but according to local reports, some 2,000 soldiers have been deployed along the border between Syria and Jordan. Other reports said some 4,000 troops, trained in Jordan, are positioned in al-Tanf border area. Syrian and Jordanian officials have not yet commented on the alleged deployment of the multinational military force. Hussain Mortaza, the head of al-Alam bureau in Syria, said on Monday that Damascus and its allies were closely monitoring military activities of the US, UK and Jordan in the southern regions of Syria. He described the move as a multinational military exercise allegedly held to eliminate threats posed by the Daesh Takfiri terrorist group. He said, however, that the move was meant to prepare for attacks against the Syrian capital. Mortaza said Daesh terrorists were not present in the area and the real mission of the multinational force, reportedly commanded from Jordan's Al Zarqa military base, was actually hidden under the cover of the so-called Daesh threat. Back in March, an AP report revealed that Washington had spent to date more than $11.5 billion on its intervention in Syria, including the training and advising of local militants and foreign mercenaries, aimed at overthrowing the government of Syrian President Bashar al-Assad in alliance with Saudi Arabia, Turkey, Qatar, Jordan, the United Arab Emirates and the Israeli regime. It added that the White House was even considering expansion of its military presence in the Arab country. The military action, coupled with American officials' change of tone over Assad's future, stirred speculation that the United States and its Western allies were ready to put boots on the ground in Syria. The US has already sent several hundreds of its special operation forces to Syria under what it claims to be a training mission with Kurdish fighters. The US and its allies have also been carrying out airstrikes against purported Daesh positions in Syria since 2014, without permission from Damascus. The warmongering stance of the Tory government was further confirmed last week, when Foreign Secretary Boris Johnson stated that Britain would follow Trump in any new US attack in Syria. It is clear that the questions of foreign policy, war and peace will feature in this election and for once there are clear differences between the two parties. Labour's leader, Jeremy Corbyn, is a former chair of Stop the War and a lifelong campaigner against war and for peace. This could not be in stronger contrast to the record of Theresa May, who refused on Sunday to say that the Iraq war was wrong, and whose closeness to Donald Trump makes her support for more wars almost certain. The war party refuses to draw any humane and rational conclusions from more than a decade and a half of ferocious military interventions, which have led to immense suffering, over a million deaths in Iraq alone, the torture of tens of thousands of people (including thousands of children), a mass refugee crisis, and the spread of terrorism across the Middle East, North Africa and beyond. On Saturday April 29, some 150 people took part in the Tyne & Wear May march through Newcastle ending with a rally and music festival at Exhibition Park. The march was led by Backworth Colliery Band. 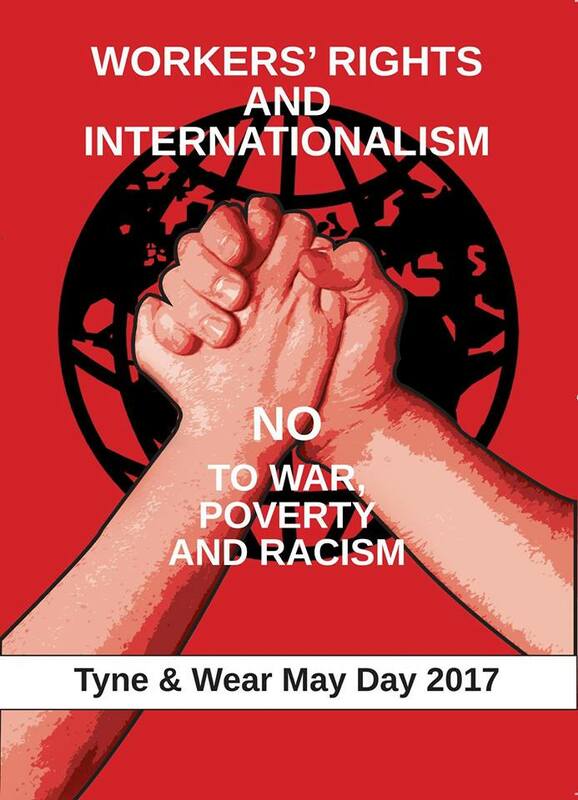 The whole event which was entilted Workers' Rights and Internationalism had the theme of No to War, Poverty and Racism. The rally was addressed by Chi Onwurah, Labour member of Parliament for Newcastle Upon Tyne Central, and Shadow Minister for Industrial Strategy, Science and Innovation. The rally was also addressed by Jorge Garcia Political Counsellor Embassy of the Republic of Cuba, Craig Johnson RMT, Laura Pidcock Northern Regional TUC and Ann Stokle Burma Campaign UK. There were also local speakers from the Durham Teaching Assistants, Keep Our NHS Public, Palestine Solidarity Campaign and Stop the War. U.S. and All Foreign Powers Get Out of Afghanistan! 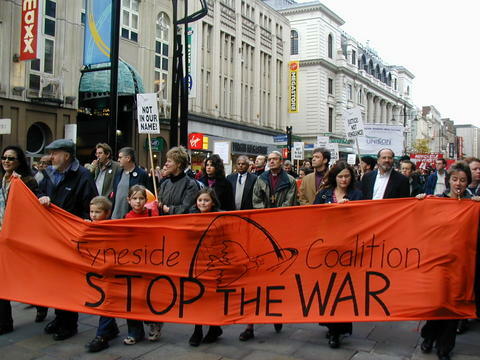 Newcastle Stop the war condemns the depraved, criminal act of the U.S. in dropping its “super bomb”on Afghanistan. A GBU-43/B Massive Ordnance Air Blast Bomb or MOAB was dropped for the first time at 7 pm local time Thursday, April 13 “four U.S. military officials with direct knowledge of the mission,” reported to CNN. Nicknamed the “mother of all bombs,” a MOAB is “a 21,600-pound, GPS-guided munition that is America’s most powerful non-nuclear bomb,” CNN said. Accordng to CNN’s military sources, the super bomb was dropped by an MC-130 aircraft, operated by Air Force Special Operations Command. “This is the first time a MOAB has been used in the battlefield, according to the US officials. This munition was developed during the Iraq War,” CNN states. The U.S. is desperate to unite its bureaucracy in the hopes of overcoming its internal crisis. Its failure to achieve this with its missile strike on Syria is now leading to wilder and wilder acts of revenge against all those who refuse to toe the U.S. line. Its assaults on vulnerable targets so as to threaten China, Russia, the DPRK and all countries and peoples everywhere fighting for their right to be deserve the condemnation of all justice- and peace-loving peoples. The British government must not be permitted to get away with giving its support to such depraved criminal actions and escalating preparations for a dangerous war of world-wide proportions. Condemn the Use of the “Super Bomb” Against Afghanistan! No to Its Use Against the DPRK or Any Other Country! Oppose the Escalating War Preparations! 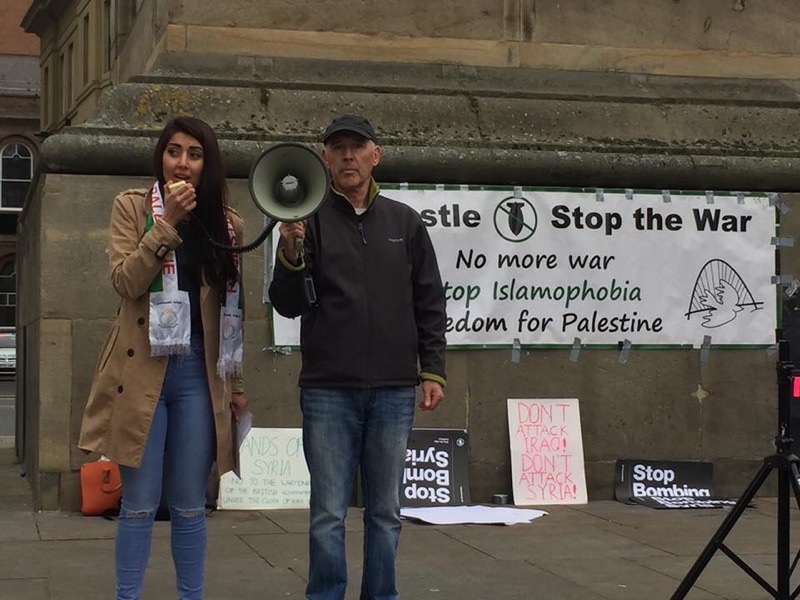 Newcastle Emergency Protest: No to Trump's Attack on Syria! No to British support! On Monday April 10, around 60 people took part in an emergency protest at the Monument: No to Trump's Attack on Syria! No to British support! Tony Dowling, Newcastle Stop the War chaired the rally. Speakers were Daniel Kebede, Newcastle Unites, Nigel Todd, Labour councillor, Chandni Chopra, Friends of Al-Aqsa working for the human rights of Palestinians, Connnor Hodgson-Brunniche, Momentum Tyne & Wear, Elaine Brunskill, Socialist Party, Martin Levy, Communist Party of Britain, Pam Wortley, Sunderland Stop the War and Roger Nettleship, Newcastle Stop the War.